Help please! The curved pieces on the Roller Brake that has the velcro on it keeps me from rolling my quilt. It gets sticky and the velcro is coming off. So I am going to Walmart or Lowes and get some more. Any ideas on this? I had to do this , just clean off the old and put on new. Mine keeps coming off to.. It is a pain to replace. I have turned the roller brake around and used the bumpy side of the velcro. There has got to be something better to work for this. APQS please come up with a better idea please. UGH!!!! Editing this! DO NOT BUY THESE STRIPS FROM WALMART! The adhesive is letting go already!!!! TOday is only 7/24/18 and they are peeling!!! And of course I'm 2 rows from finishing a quilt! Just wanted to add that I tried Jim's suggestion and it works GREAT! 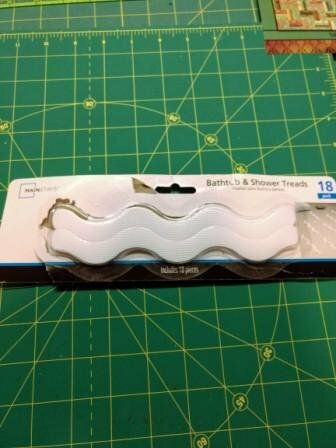 I used goo-gone to clean the residue from the brakes and my rails and after a bit of trimming, used the tub strips pictured - wavy was all my WalMart had in stock. (2 per side). I have plenty left for any future needs.